Today, we will talk about palak paneer recipe, a very popular North Indian dish again. Did you see my earlier post? Yes, that was also a delicious North Indian curry, Butter Chicken. Whenever, we Indians go out for binging, few resturant style veg curries always tops the menu i.e spinach Paneer, Paneer Lababdaar, Paneer Makhanwala and PalakPaneer Kofta, Shahi Paneer Dal makhani Paneer Pasanda many Paneer butter masala, Matar Paneer. There were so many requests from my lovely readers to post best palak paneer recipe. So, I decided to revive my very old recipe of palak paneer blog post and repost it today. The reason why I wanted to update the post is, an old post had such a pathetic photo that was shot by mobile back then in 2013, lol! Well, i didnt had a camera that time to shoot my food pictures :). Trust me, it is very easy palak paneer recipe to make at home. All you need to do is, follow some important tips and tricks which I will be sharing in detail below. 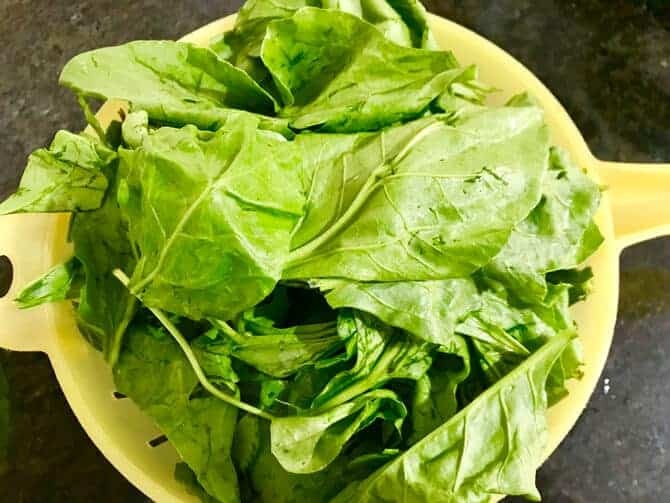 How to blanch spinach to make best Palak Paneer Recipe? Another key point is, good amount of oil to be used to make perfect spinach paneer curry. I know, this may surprise you, but yes we have to use good amount of oil into it. However, I feel there is no harm in indulging into a proper restaurant style food at home once in a while. Indeed, even the diet regime says ‘A Cheat Day”, right? So, I would strongly recommend to use the amount of oil mentioned below in this recipe. Palak Paneer curry is truly a crowd pleaser palak dish anywhere and everywhere. 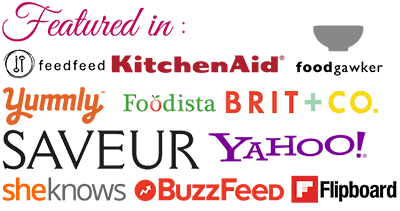 Suprsingly, it do not require exotic ingredient to make at home. I simply opt to make this palak paneer sabji whenever i want to make something really quick that will be ready in flat 15 minutes. 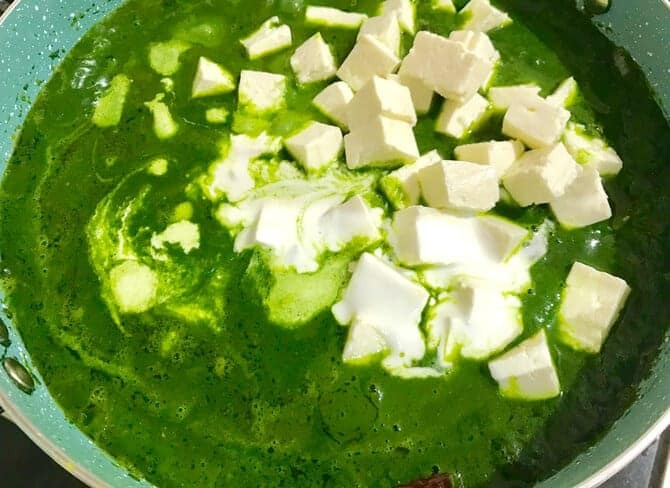 For this recipe, we need fresh spinach and fresh malai paneer cubes. The blanching of palak has been explained well above and in picture below. Then we need, sliced garlic, cumin seeds, green chillies, whole red chillies, chopped onions and chopped tomatoes. 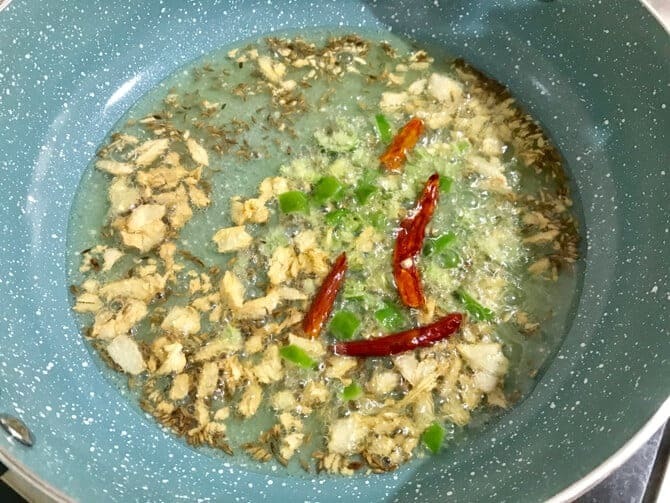 The spice powders, that we require here are coriander powder and garam masala powder only, Then finally we need, fresh cream lemon juice and oil. 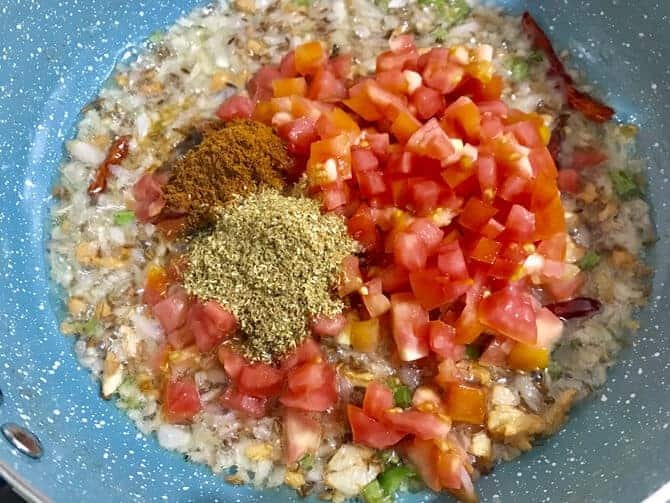 For smoky flavour, you can go ahead with dhungar method, that i have explained with pictures in chicken tikka masala post. Furthermore, i highly recommend you to go for tadka over it. 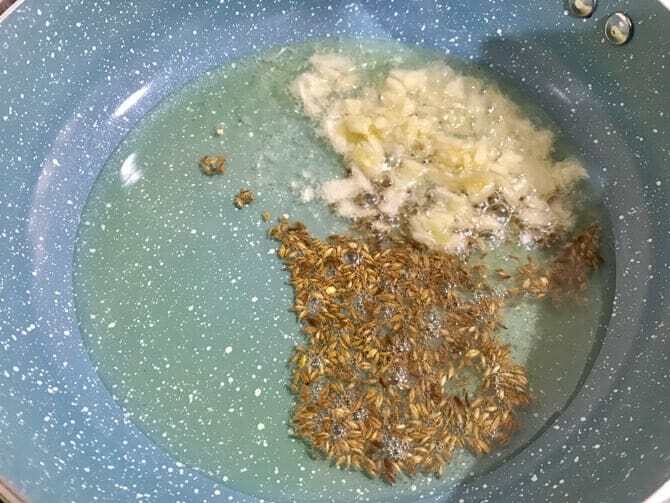 Usually, i use garlic and jeera both for tadka, but you can use cumin seeds only, like how i had done below. 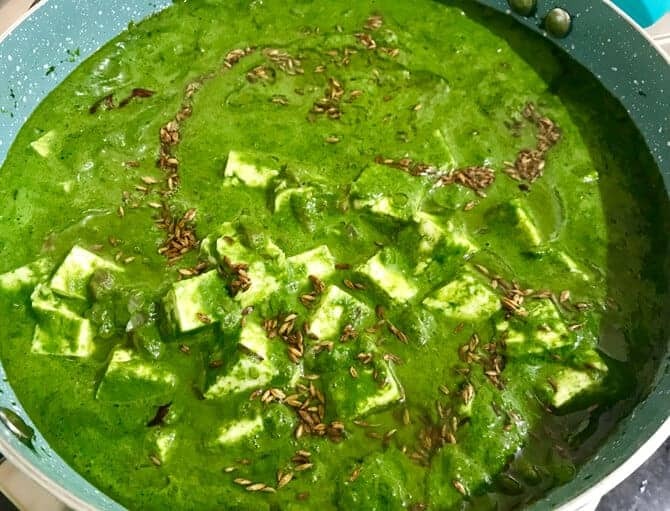 How to make Palak Paneer vegan? Are you looking for best vegan palak paneer recipe? So, you are at the right place. To make vegan version of this recipe, a couple of things we need to do is, just swap paneer with tofu paneer and fresh cream with cashew cream or coconut cream. Thus, you have the best palak tofu paneer recipe at home. 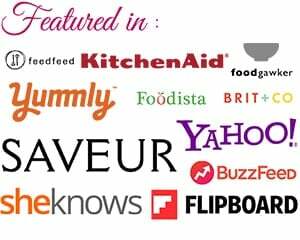 So, it is not only vegan, a dairy free recipe but also gluten free vegan palak tofu recipe right at your table. Can Palak Paneer be frozen? Yes, we can freeze palak paneer easily upto 2 months in a freezer in a clean air tight container. Just thawa it a counter and reheat it in microwave or in pot on stove top. Addtionally, you can pour tadka again on the top and it will be as good as fresh. Infact, you can also, freeze blanched spinach puree in portions for good 6 months. This way, it becomes easy for me to make any blanced palak dishes in jiffy. One more important tip here is, whenever I make any paneer recipes at home, I make sure to microwave it for a minute or two. An essential step is to dip the paneer in enough water such that they are completely immersed and then microwave it. If you dont have microwave, then dip the cubes in enough of hot water for a two minutes, just before cooking. step ensures the paneer stays soft and is ultimate mouth melting. Also, in any paneer gravy, never ever cook paneer for very long time, as it makes the paneer hard and chewy. After all, this is everyone’s favourite recipe, I haven’t come across anyone who doesnt like Palak Paneer. Whenever, you plan to make this so delicious recipe, please do not forget to follow the above mentioned points. So, without wasting any further moment, I shall straight go to see how to make best palak paneer recipe in restaurant style. Trim the stem of the spinach, wash and clean. 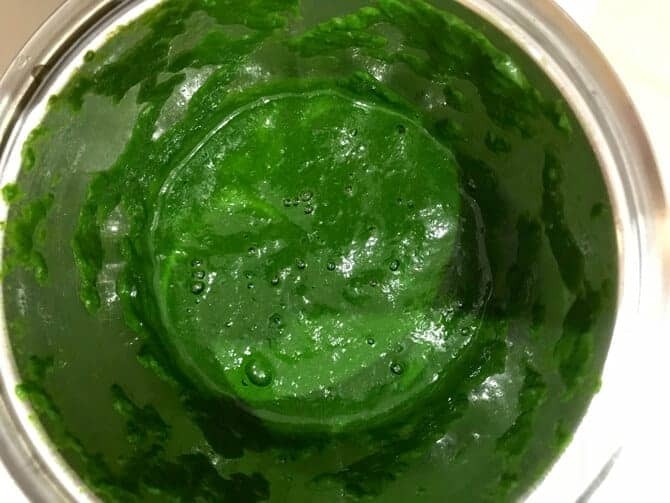 Put the blanched spinach in a blender and blend it to a puree. 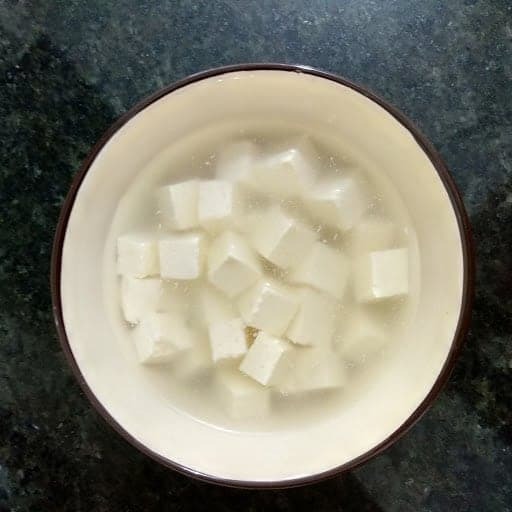 Dip the paneer cubes in hot water for 3 to 4 minutes or microwave it for 2 mins. This will enable the Paneer to retain its softness. 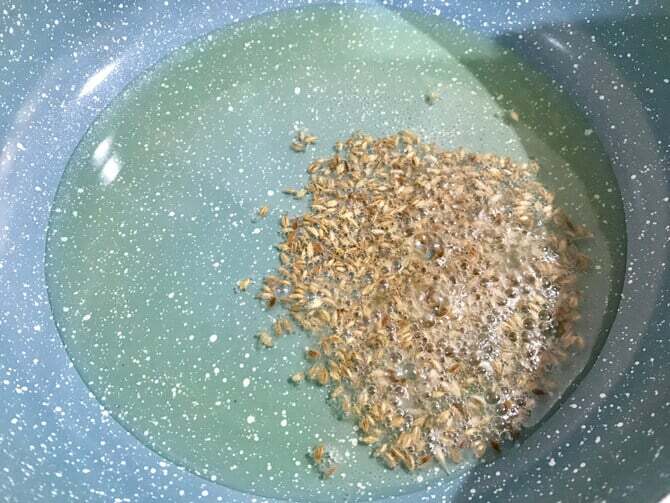 Add cumin seeds, allow it to crackle. Then, add crushed garlic and fry till its golden brown. 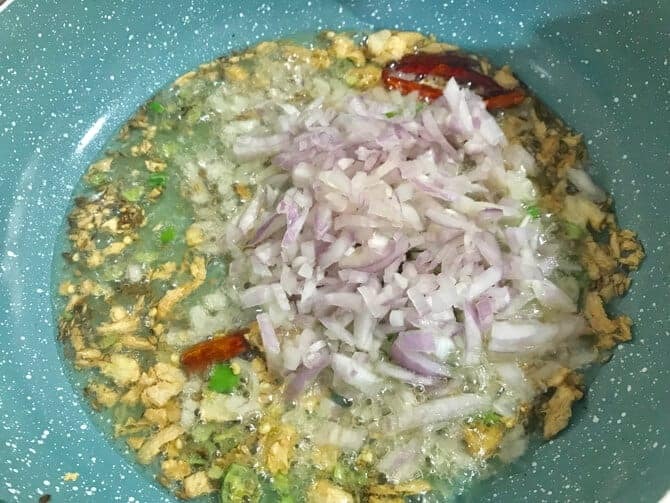 Now, add broken whole red chilies and green chillies. Fry for 15 seconds. Add chopped onions, and saute till it turns translucent. Now, add chopped tomatoes, coriander powder, garam masala powder, salt. Mix well. Cover and cook till the water of the tomatoes dries up and it becomes very soft. Increase the heat to high, add pureed spinach and saute it for a minute. Now, add Paneer, cream, mix and saute for another minute. Next, add lemon juice, mix and immediately take it off the stove. Heat a tablepsoon of oil in a small pan. Add cumin seeds and allow it to crackle. Dish out and garnish with cream. Now, place a small bowl or small pieces aluminium foil on the palak paneer curry. Then, with the help of tongs, carefully place the live charcoal over the foil or in the bowl. Top it with 1/2 teaspoon of ghee and immediately close the lid. With lid closed, leave the spinach paneer gravy undisturbed for 5-7 minutes to infuse the dhungar well. 2. 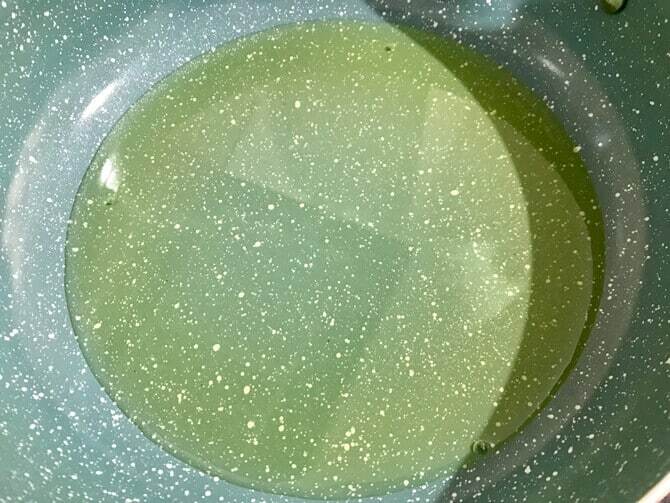 In a large pan or vessel, boil enough of water. Then, add soda and spinach. 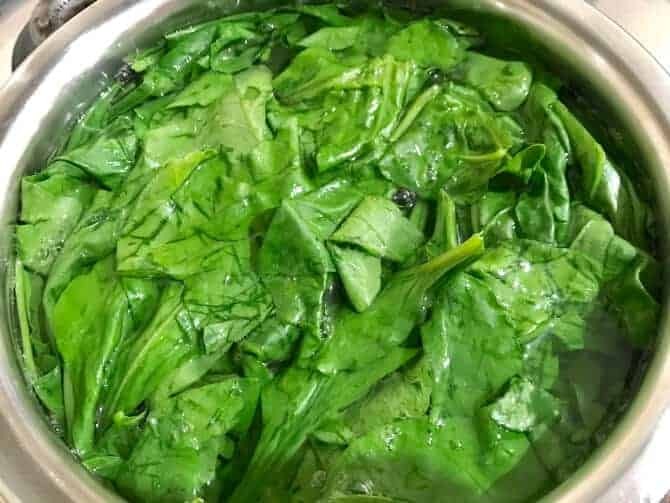 Allow the spinach to blanch in the water for 2-3 minutes. 3. 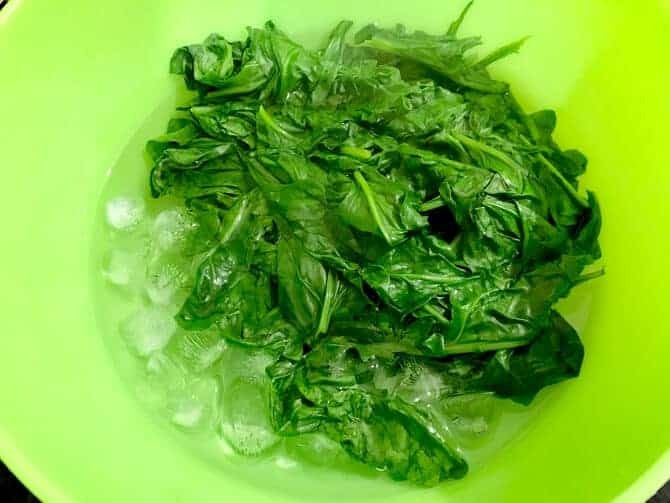 Now, take the blanched spinach out and immediately put them in ice cold water. 4. Then, put the blanched spinach in a blender and blend it to a puree. 1. To begin with, dip the paneer cubes in hot water for 3 to 4 minutes or microwave it for 2 mins. This will not only enable the paneer to retain softness but also prevent it from getting chewy. 2. Now, in a heavy bottom pan or kadhai, heat oil. 3. Once the oil heats up, add cumin seeds, allow it to crackle. 4. Then, add crushed garlic and fry till its golden brown. 5. Now, add broken whole red chilies and green chillies. Fry for 15 seconds. 6. Add chopped onions, and saute till it turns translucent. 7. Then, add chopped tomatoes, coriander powder, garam masala powder, salt. Mix well. Cover and cook till the water of the tomatoes dries up and it becomes very soft. 8. 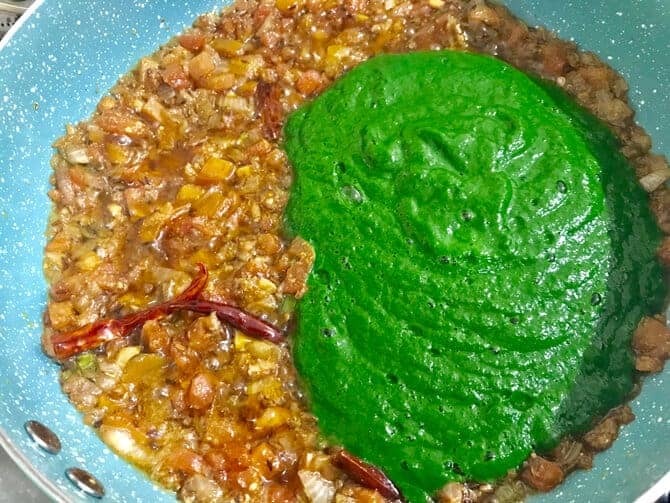 Once the tomatoes dries up, increase the heat to high, add pureed spinach and saute it for a minute. 9. Now, add Paneer, cream, mix and saute for another minute. Spinach is one of the major source of vitamin A and loads of Iron that is good for ladies. I really like the texture of your palak paneer and I will cook this on Sunday, for sure. Yes, do try and feel free to give feedback on it.